I have kind of got a bit of a name for myself when it comes to opinions on ukulele strings. I'm no fan of people telling others that 'brand X' is the best there is. Strings are totally personal and people should experiment and find what they like themselves. That said, reviews and other peoples opinions can be helpful, so take a look at these from La Bella. A month or two ago, my band was contacted by Bob Archigan of La Bella strings asking us to take a look at their new 'Uke-Pro' series for ukulele. A bundle of sets duly arrived and we have been playing them for a little while now. The Uke-Pro strings we are testing are the No.100 grade, and form part of a range of La Bella products for uke. The 100 grade are made for concert and tenor ukes, and also in the Uke Pro series is the No.200 pack which is made for soprano. La Bella have a very respected name in strings for classical guitar so we were keen to take a look. On opening the pack, the colour is the first thing that stands out. 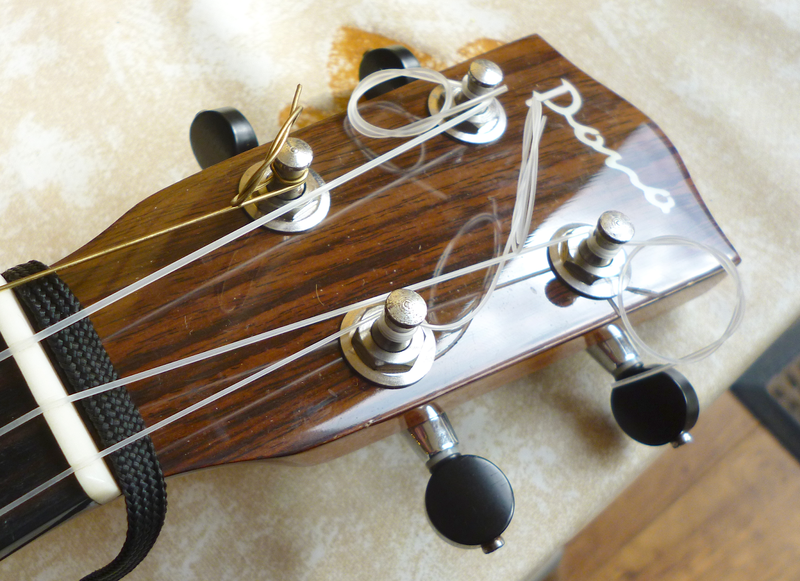 In the uke string world, the vast majority of strings are black or clear / white. In the clear / white camp, the usual way to identify a white string is 'it's probably by Aquila'. These La Bella strings though fall in between clear and white. They are slightly translucent, but not anywhere near is solid white as Aquilas, yet certainly not totally clear like Worths (am I making any sense?). I fitted my set to a Pono Tenor ukulele, and also went with the extra wound low G string (and that is unusual for me but read on). The low G is an extra purchase and comes as a single string. So off went the old and on with the La Bellas. Initial observations were that they settled down far quicker than most other strings I have used (and in fact stayed that way). Quite remarkable. I'm not saying they didn't need some re-tuning, but the process was certainly quicker. The feel of the strings also falls in that halfway house between Aquilas and other flourocarbons in that they have a kind of semi rough quality. Not glossy and slippy at all. Actually that rough feel is one of the things I don't like about Aquila strings, but these are not to bad on the fingers at all. Incidentally, the packaging doesn't say whether these are nylon or fluorocarbon so that remains a bit of a mystery to me. And what about that low G string? Well I do regularly play low G on my tenor ukes, but only ever play unwound low G strings. The reason for that is I tend to find wound strings are louder or take over the mix from the other strings, and that irritates me. It was therefore with some trepidation that I put this one on, but I had no choice as La Bella don't make an unwound version. From taking them out of the pack I noticed this one was a little different. The winding is almost completely invisible as it is very fine and tight. As such it looks like it's made of solid metal. And that quality extends to how they feel. Many wound strings can make a sound as you run your fingers up them, but these feel just like the un wound strings to me so that is a big plus for me. And how do they play? Well I find them very comfortable and that low G string is perfectly balanced in the mix. Throughout this review I have been making the point that (looks and feel wise) they seem between Aquila and Worth. When I spoke to another of the band, that is exactly what he said about the sound and I think that he is right. For me, Aquila strings can boom and overpower a solid wood instrument. They sure have volume, but I think they can kill tone. Worth flourocarbons on the other hand can sound very sweet but can (on some instruments) lack a little punch I found. And these La Bellas seem to deliver a bit of both - they have the attack and volume of an Aquila string, but a sweetness in tone, particularly when they are finger picked. I actually think these sound far better picked than strummed (though I would say that about Aquila too) but they do have qualities of all sorts of strings I have tried. The response from others in the band is also positive, so I think La Bella may be on to something here. Of course, with their heritage that shouldn't come as a surprise..
As I said in the introduction - I don't ram string opinions in peoples faces, as only YOU will determine what strings you prefer. I would however heartily recommend that you give these a try as you may like them. Years ago I always used La Bella classical guitar string on an old Gretch Classical guitar I took to sea with me. Loved the sound and feel. Very interesting and informative review especially the low G comments as I am just starting to fool around with that on a ukulele. I definitely don't like the low G with the Aquila Strings I use, just doesn't sound quite right. Thanks for the review of these. I know that you like the 'Living Waters' strings (as do I) , how did these strings compare to that brand ? Many thanks for the review. I have been enjoying trying different strings out and I put a set of La Bella No. 100's on my solid acacia tenor yesterday after reading your review. I really like them. I think they are really high quality and full of character. I think you are dead on with sighting them as a sort of halfway between Aquila and Worth as well as Living Water. I think my tenor might be slightly over-built so I also very much agree with your comment that flourocarbons "can (on some instruments) lack a little punch". With the LB 100s and their quite thick gauge, I find my uke is louder and I can feel the body vibrating which is nice. I do however miss the pretty chime of flourocarbons and I don't love the 'swishing' sound my fingers make on the nylon strings (but it's better than rougher Aquilas). From your experience, do you think something like denser Worth clear strings such as hard, extra, heavy or fat would provide the punch of the LB 100s but maintain some of that nice flourocarbon chime? I tried these on my Fluke and Bruko, and had massive problems with them pulling sharp when fretted. Particularly the C string. (We are talking half a semitone out on the C string.) I'd put it down to me (but my Ohana Tenor is fine with fremonts, no matter how hard I press!) or the uke (but its a fluke, and the no 6 had almost exactly the same problems!) I could just about get them playing it tune when I barely pressed on the string, but then I have problems with muted notes, the difference in pressure is too small between 'muted' 'spot-on' and 'sharp'. They do sound really nice and feel good on the fingers though!